Why are they getting worse? How to really keep them out? To effectively combat your scorpion problem, start where you least want to find a scorpion rather than where you “think” the problem is. 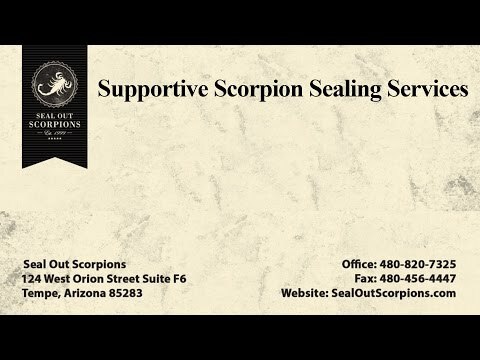 The solution to a scorpion problem or scorpion infestation in your Arizona home is not the killing of individual scorpions, but controlling a population that is flowing through your neighborhood. You need to have a methodical and systematic approach to eliminate and deter scorpions on your property and ensure a long-term scorpion solution plan. Together, our experienced scorpion control contractors partner with you and your family to help achieve this goal. The first step is a comprehensive weatherization and sealing of the home to keep scorpions from getting inside. The weatherization and sealing should consist of 75% of the efforts on interior seals and 25% on exterior seals. This one step, if done appropriately, will make the most significant difference in keeping scorpions out of the home. Reducing desirable habitats with regular yard and property maintenance is key. It is also helpful to reduce unneeded moisture from overwatering or leaky hoses and spigots along with keeping items off the patios and grounds. While most of our clients do no do this step due to fear of scorpions, effective black light searches will significantly reduce and catch new scorpions that invade your property. These searches are best done during the warm season, on a calm night during the new (dark) moon phase. These natural products provide a great supplemental strategy to repel scorpions from treated areas and help deter scorpions from vulnerable entry points and away from the home. It is essential to have an understanding how to most effectively use these products in the southwestern desert environment against species of scorpions that are avid climbers such as the Arizona Bark Scorpion. While this is usually a resident’s first approach, this should be considered the last phase of an optimal scorpion control program. It’s important to understand the different types of products available and what works best in arid climates with harsh conditions. Such climates significantly reduce chemical effectiveness along with their natural limitations against the Bark Scorpion species. Blindly hiring a pest control service to start spraying, dusting your attic and behind outlets or to do a partial or haphazard sealing will not control your scorpion problem. job is to partner with homeowners and commercial business managers across the Phoenix Valley to help keep scorpions out of the house and living on the property so they can relax in their homes. We help take the frustration away and answer the questions that pest control companies do not have. Understanding the facts about scorpion habitats and behaviors along with effective strategies to preventing scorpions from entering your home, based on scientific factors of our urban environment, building science, materials, repellent and insecticide chemistry will provide an effective and affordable approach to scorpion control.